Usually women love to dress up formally, but when you are pregnant it can be a little difficult. When you get invited to a formal event, the insecurities surface and women feel they will not look their best. You are wrong! No matter how panicked you are, it is a fact that woman’s beauty enhances when she is pregnant. Do not forget to try on dresses before buying them for the formal event. The tips below will guide you on how to look your best during these months. During these months, be conscious of the colors you are wearing. Do not pick pastel shades as they will make you appear fatter. Go for deep shades like black, blue and burgundy. These colors will make you look decent and elegant. They are also good for covering the baby bump. As the shape of your body changes, so do the cuts that suit you. Try on different dresses before deciding one which flatters your body. 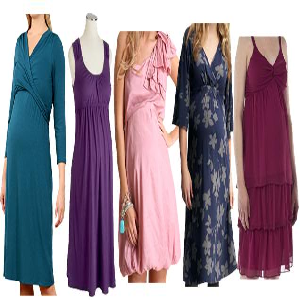 Pregnant woman look good in empire cut dresses: they enhance the bust line and are loose in the belly. Also go for sleeveless tops instead of spaghetti straps. It is reality that pregnancy will leave you with stretch marks. Some formal dresses have a lot of exposing materials used, which will expose all the lines and the bump very obviously. The simplest solution is to purchase dresses made up of a thick fabric. If you really want to wear a dress that has a very see through material, wear a slip underneath it. You can also wear a shawl if you are conscious about fat arms. They also look very sophisticated. Do not even try putting on your stilettos. As you are heavier and most probably have swollen feet, they will be impossible to carry. Try to find an elegant pair of ballet flats. They are very popular nowadays, come in every shade, and are very easy to wear. If you really want to wear heels, they shouldn't be more than two inches. In these months, your hair and nails become very healthy as you are taking vitamins. It’s time to show them off. So spend some money and get a great hairstyle from a salon. 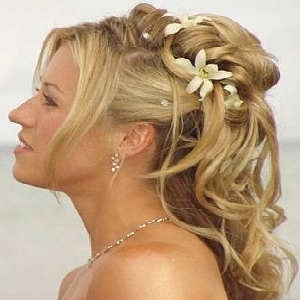 Your hair will look formal and well set and you will not have to waste energy in making them yourself.